It would seem that to type more quickly, you just have to type a lot. It also may seem taht it will just work out itself or that if you look at keyboard and try to press the keys as quickly as possible will lead yout to achieving an incredible typing speed. Unfortunately both of these approaches make you perpetuate yourself bad typing habits. The more often you use your keyboard in an incorrect way, the harder it will be to learn to type later with the correct fingers. But why shoul you type using ten fingers slowly, when you can type with two fingers fast, or why should you at all use a typing convention? We will try to answer these questions. A common mistake is to learn to type faster by focusing on speed. Think whether you want the text you enter to have a lot of typos, no punctuation and to be difficult to read? You obviously do not want that, so maybe it is worth focusing your attention on typing properly? Yes, but what about the speed? Well, if you type correctly, you do not think about correcting mistakes. You do not have to go back, read what has already been entered. If you do not make mistakes, you can focus on speed. When learning fast typing does not bring any effects, slow down, focus on not making typos, and in time you will start typing more accurately. Without regular exercise, it will be difficult to master the keyboard. It is not enough to type often, but you have to learn to type. However, there is one condition for the exercises to be effective: you need to type correctly. This can be repeated like a mantra, but clicking the correct key with the correct finger and not making mistakes is the key to learning fast typing. There is no rule about how much you should practice each day, but the more you exercise, the better. Since the most important thing in a quick typing exercises is to make sure you do not make any mistakes, you should be focused on the typing activity more than on the text you type. You will not be able to focus when you need to get your work done as soon as possible or when you are being creative when creting an essay. You need time just for learning. Not every keyboard is the same, even if you use the same language. Some keyboards contain 104, others 105 keys and there are even keyboard with 106 keys. Some have a small "Enter" button, another big one, similarly they can have either a long or a short spacebar button. Most of the differences concern keyboards used in laptops, because different laptops have different dimensions and manufacturers are not always able to insert a full keyboard into the laptop, such as an 11-inch netbook. Almost every keyboard has keys on the middle row - almost always the "F" and "J" which feel different than other keys. Your index fingers should reside on these keys as you type. These are reference points for clicking every other key. They allow you to find the keys correctly - when touch typing the process of finding keys and using the reference keys is beyond the consciousness of the peron who uses fast typing techniques. It is not a surprise that the most important elements of your body when typing are the hands and fingers. Just like in any sport, they need warm-up - especially if you use a computer at work for 8 hours straingt. All kind of bending the fingers, hands, wrists (doing circles) is recommended. It is also important to stretch your fingers and move around the wrists in the intervals between typing. When you feel your hand is tired of typing, give it a rest. Then shake your fingers and hands. 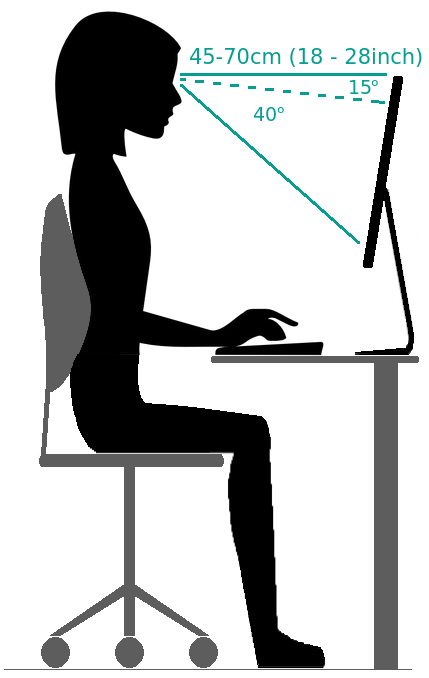 The position of the body when you sit in front of the computer has a significant effect on how you type. The correct body position allows you to be more relaxed and less tired. There are several rules for positioning your desk, chair and the height of your monitor. The illustration below shows all the basic rules. You should sit upright. The knees, like the elbows, should be bent almost at right angles. Adjust your desk to a position that allows you to sit comfortably. Usually desks are not very adjustable, but the desk chairs are. Since not everyone is the same height, you should adjust your chair to the height of your desk. The problem is complicated in the case of relatively small children who should not sit in adult chairs in front of a computer, but special chairs which are adapted for children. There are also chairs with special foot pads if your child's feet do not touch the floor. It is important to find the pace of typing that makes you feel comfortable. Do not focus on speed, because it will be unnatural, you will exert unnecessary pressure on yourself. Typing should be a pleasure. Do not discourage yourself! It happens sometimes when learning fast reading, where very strong pressure is exerted on the speed of reading. After the course people read actually faster, but some even completely stop reading. The joy of reading has been diminished, their subconscious mind associates reading with compulsion, effort, and something they do in spite of themselves. When you push yourself to type fast at all costs, you can produce the same result. It is better to get results later than not to achieve them at all. Remember that. This is true of any kind of learning. Learning is a pleasure, but it can become a nightmare and you will reject it. Touch typing is a technique that involves typing without looking at the keyboard. The most important in touch typing is the correct hand position of hands and being consistent with the finger - key convention of using the keyboard. To type without looking at the keyboard, follow all previous recommendations in this article. It is important to initially put the index fingers on the special keys (usually "F" and "J"). This is a reference point for all fingers. The key to learning touch typing is to focus your attention not only on accuracy, but on the use of the right finger to press the corresponding key. Do not be afraid to look at the keyboard while learning to write. It is more important to press the correct key with the correct finger rather than to do it without looking at the keyboard. This may seem strange, but it is effective. Your muscles will remember the convention you use in typing. Using wrong fingers, misleads your muscles, teach you bad habits, and all the practice of typing faster can go wrong when you do not obey the convention. Even if you look at the keyboard while studying, after some time (this is different for everyone) you will stop doing it, because the muscles will know which key to press with your finger. There are many web pages that are called fast typing course . Why did we create AgileFingers? We think that the key to typing faster is to be accurate. AgileFingers focuses on learning the correct hand positioning and finger-key mapping. That is why we created virtual hands that show which finger to use. The speed if less important in the process of mastering your keyboard. We created this course as best we could. AgileFingers is constantly developing, because we know that with fast typing without looking at the keyboard, you'll be healthier, more relaxed and you will save a lot of time.